Simulation games are all about immersion; making you feel like you’re in the game, rather than staring at a monitor. Elite Dangerous is a perfect example of that, and with a couple of upgrades, you can make the game so much better. Let’s have a look at both some high end, and some budget ways, of enhancing your time with Elite. The ultimate goal of every self-respecting geek has finally been achieved: we have two fantastic quality virtual reality headsets that have launched this year, though both are back-ordered until the latter half of 2016. The Oculus Rift (our review Oculus Rift Review Oculus Rift Review Virtual Reality is not new, but it's finally affordable and within our grasp. After four year and two development prototypes, the final consumer edition of the Oculus Rift has arrived. Read More ) is $600; while the HTC Vive (our review HTC Vive Review: Virtual Reality is Finally a Thing HTC Vive Review: Virtual Reality is Finally a Thing The HTC Vive for Steam VR redefines gaming, and more besides. It's the closest thing to a Holodeck I've ever seen. And it's absolutely incredible. Read More ) is $800, and comes with fully motion-tracked controllers and the capability to run a more immersive room-scale experience. Since Elite is a seated game, either headset would suffice to give unparalleled feeling of immersion in the Elite universe, though the Vive will give you a broader range of experiences should you ever venture outside of space sims, and in future, you might even be able to walk around the bridge of a starship. 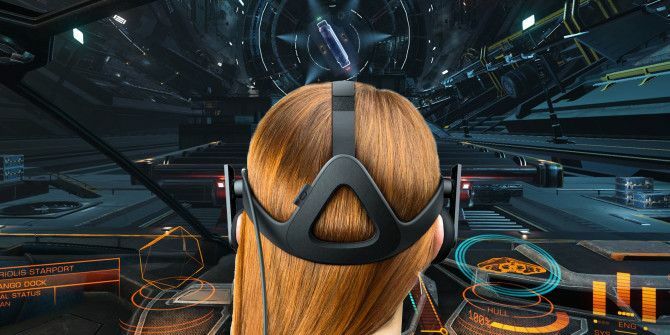 At the time of writing, Elite looks significantly better with the Oculus Rift, but this is likely a software bug with the Vive rendering that will be fixed soon. Both require a beefy PC to run Oculus Rift Is Almost Here! Check Now If Your PC Can Handle It Oculus Rift Is Almost Here! Check Now If Your PC Can Handle It Before you go ahead and buy an Oculus Rift, take one minute to see if your PC is powerful enough to handle it! Read More , but you probably already meet the requirements if you’re running Elite on top graphical settings. 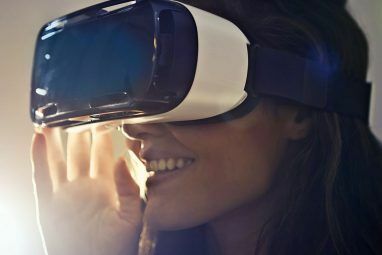 You’ll have a full 360-degree view to appreciate your spacecraft like never before, but one thing to bear in mind is that the resolution of a VR headset is significantly lower than that of a top-end PC monitor – right now, the Vive and Oculus Rift are 1200 x 1080px per eye. That said, I haven’t had any trouble reading text or instrument displays, but distant planets can look at little pixelated. If visual fidelity is your priority, stick to a big high-resolution monitor or multi-screen setup, though I would strongly encourage you to try VR when you have a chance, as it’s difficult to convey in words how absolutely game-changing the experience is. Just imagine playing the game by actually being in a space ship; not just looking through a window into one. 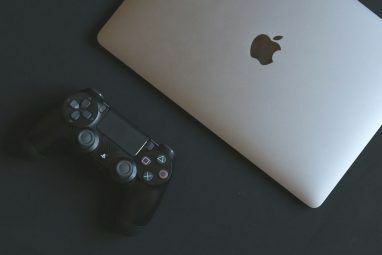 You probably don’t need to be told this, but flying around with an Xbox controller or even worse, a keyboard and mouse, is terrible for immersion. Instead, you want a Hands On Throttle And Joystick, or HOTAS. The throttle and joystick you see in your in-game Elite cockpit is modeled on the Saitek X52 line, so either the X52 or X52 Pro are the ultimate choice for “realism”, if you can stomach the $100-$150 cost. The X52 has a dizzying array of 36 buttons, dials, axes, and all manner of things you can twiddle – customizable in-game or with the supplied profiler software. At the the budget end (though still a respectable quality stick) is the Thrustmaster T-Flight, which comes in at a perfectly affordable $50. The throttle can be detached. If you have a tablet lying around, a great way to add immersion and simplify controls is to map them to your touchscreen using an application called PowerGrid, free on iOS and Android. Using either a custom-designed panel or one of the many presets already made, a piece of host software on your computer acts as the intermediary, rendering the control panel to your mobile device. Try this ready-made profile for Elite Dangerous, or make your own. Here’s something to work towards: the most dedicated Elite player yet, with three projectors surrounding a custom cockpit, and no less than 5 tablets running PowerGrid! VoiceAttack also allows you to get voice feedback after a command is issued, so your onboard computer can talk back. The default Windows voices sound a little synthesized, but HCS Voicepacks sells additional voice profiles for £10 (around $15), which include hundreds of predefined responses. For those with both the space to put them and understanding partners who’ll forgive the cost, a realistic cockpit can be an essential accessory, optimizing HOTAS placement and comfort on long-haul explorations. The Gamecab Flight from Elite Gaming is an affordable model for Brits at £399, though it also serves as a good design inspiration for your own DIY efforts. CMDR Mackenheimer put his own sparse cockpit together using a commercially-available Playseat, a HOTAS, pedals, and mounted everything on some metal sheeting to finish the look. He’s also using a VR headset. From a 100% DIY perspective, the Command Pod 1 by KerbalSpaceProgram user ThereIsOnlyOne is the clear winner. It’s custom-built from sheets of MDF with a professional-looking leatherette finish on the chair, and includes a stowable command console in the center (not pictured, but it’s there that one places a tablet with PowerGrid controls). Read the linked thread for full build details. Tactile transducer are speakers that shake instead of producing a sound – a huge rumble pack, basically. While a subwoofer would vibrate the air waves (and therefore, make a sound), a bass shaker bolts onto something solid, usually your chair, and vibrates you instead. This makes it possible to actually feel the roar of the engines, or the blasts of your multi-cannon. There’s a couple of ways you can achieve this. The easiest option? Subpac M2 is a vest you can wear, but can be a bit awkward for short gaming sessions; the S2 model attaches to the back of your chair. A commercial bass shaker like the Buttkicker Gamer 2 is the most popular, but frequently out of stock. It’s designed to clamp onto a swivel chair, and though you can buy adapters for racing seats, if you have your own custom-built cockpit then you’re better off with this cheaper single-seat Aura Pro kit which can be screwed directly on. Considering that even the most casual of Elite players will spend countless hours every week in the expansive Elite universe, it’s absolutely worth making your time there that much more immersive. Have you built your own custom cockpit, or integrated a bass shaker into your set up? Share your experiences in the comments! Explore more about: Game Controller, HTC Vive, Oculus Rift, Virtual Reality. does the second screen works also on Xbox? Whoa, thanks for sharing Ross. That's incredible, but the price tag is also rather eye watering! looool the ghetto computer made me laugh. But I have seen some amazing voice packs for this game though! I mean, i see it useful if you're in a HUGE battle with multiple ships, and needing to multi task while evading and firing and managing damage.